All crystals in this section weigh at least 90 grams and are some of the finest Brandbergs available anywhere. The Brandberg range in Namibia has produced the most spectacular and vibrant healing crystals ever mined. Several well-formed Negatives Manifestation Enhydros (crystal shaped water pockets) and moving bubbles in this museum-grade Skeletal Gateway crystal. Stunning Skeletal layers make up the entire main face and recess to the crystals centre. Seriously rare. How rare? Try and find another on Googles 179 million "crystal healing" pages. Beautiful lavender amethyst flames. The little keys where calcite has dissolved is a kind of growth-interference where the calcite leaves it's energy amplifying frequencies within the quartz. 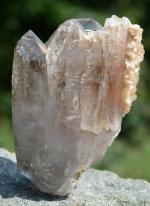 "In growth interference quartz the energies of calcite are combined with quartz to bring a powerful healing." Melody, "Love is in the Earth". The 4 tips of this unique Omapeleki Brandberg surround a deep gateway. 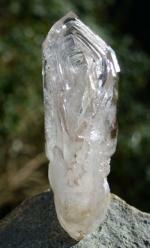 This is the closest crystal to the rare Horn of Plenty formation we have seen. Extensive self-healing and some beautiful Calcite passengers. 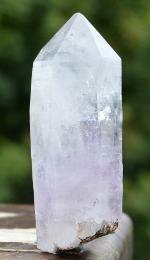 Search the interior with a loupe for many crystal shaped water pockets - the rare Negative Manifestation Enhyro. Unique. Omapeleki Brandbergs are mined in the remotest regions of the Gobogobos mountains, making them extremely rare. They are brightest of all Brandbergs and uniquely energetic.